First one to comment! XD Wow, Kamui and his twin XD This wall is dark and seductive <3 Brilliant vectoring too! You should put FULL VIEW because the (awesome) sketch effect can only be visible by fullviewing it :) Impressive! Keep it up! Ah thank you for the present. it's lovely wallie >D with that sketchy and grudge effect. I hate you abuuuullllll! For vectoring this wallie. Thank you for sharing. + fav. Now how come I didn't notice this before? I even knew you were doing this picture. Sheesh. Anyway, wall looks cool, that's good enough for me! ack! 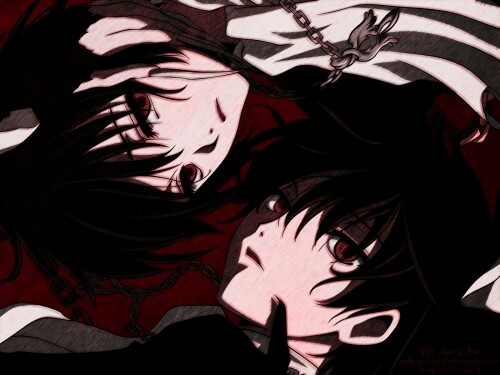 the vampire twins are so creepy, but very fascinating too! these's tsubaru and kamui right?